The LC8S10C is a 8-Pack of LeadCheck™ Swabs. These swabs offer an easy testing solution for detecting the presence of Lead. The LC8S10C Swabs are disposable, odorless and non-staining. The Swabs are safe for use on virtually any surface including Painted Wood, Metal, Plaster, Drywall and much more. The swabs are designed for the ease of use, simply Crush, Shake and Swab. The indicator almost instantly turns a Bright "Pink" when lead is detected. Always remember "Red Means Lead". Each kit includes test confirmation cards to verify individual test results. A majority of results appear in less than 30 seconds and each swab test can screen Lead presence up to 600 ppm (Parts Per Million). Each LC8S10C Kit contains eight (8) individual test swabs and a test confirmation card. *The Consumer Product Safety Commission (CPSC) requires the amount of lead in paint to be less than 90 ppm and the amount of lead in children's products to be less than 100 ppm. 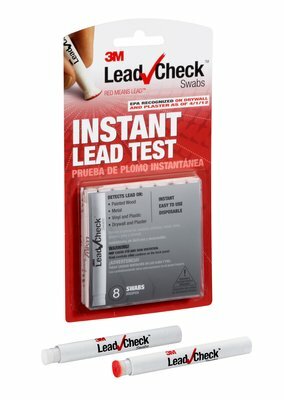 3M™ LEADCHECK™ SWABS ARE CURRENTLY UNABLE TO SCREEN FOR LEAD IN PAINT OR IN CHILDREN'S PRODUCTS AT THESE LEVELS.